Students looking at a large hot pool in the Rabbit Creek thermal area. Viruses of Archaeal hyper-thermophiles (temperatures in excess of 80oC) are interesting because they can reveal what kinds of biochemical modifications organisms have undergone to withstand the stresses of surviving in such extreme environments. This is fascinating in terms of basic research, but also particularly relevant to the biotech and manufacturing industries. Proteins and molecular mechanisms that function in harsh environments can be applied to industrial processes that require similar conditions, such as low pH and elevated temperature. TEM taken by author, and cryo-reconstruction done by Liand Tang of the Scripps Research Institute. On the left, a Transmission Electron Micrograph (TEM) is shown of Sulfolobus Icosahedral Turreted Virus (STIV). 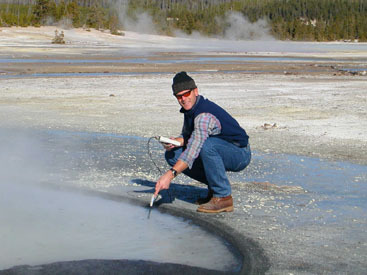 STIV is one of the newly discovered thermal viruses from YNP. 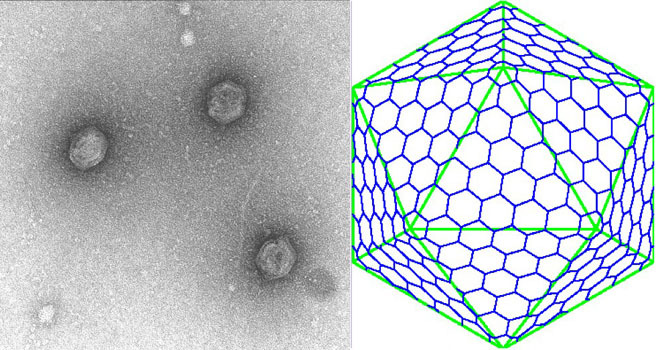 On the right, the unique lattice of this icosahedral virus is shown superimposed upon a cryo reconstruction. Learn about-Are Viruses Alive?- this website, part of MLER, discusses viruses and whether or not they are alive. It includes a link to a Socratic questioning teaching activity.